Construct approximately 1.3 miles of multi-use path along the roadway to be included as part of the CVG Trail and to connect Conner High School to surrounding residential and commercial development. Include curb and gutter where necessary. A dedicated bicycle and pedestrian facility would be provided along Conner Road to connect residential properties and Conner High School to the Cincinnati-Northern Kentucky International Airport (CVG) loop trail network. The project would connect to a proposed multi-use path along KY 237 and to an existing sidewalk along KY 20. The project will provide pedestrian signals at the KY 237 intersection with Conner Road to connect the existing sidewalk along Wright Boulevard and the proposed multi-use path along KY 237. The proposed multi-use path will support Boone County’s overall goal of improving safety and connectivity for bicycles and pedestrians. Click HERE for a map of multi-use paths in Boone County. There are overhead utilities that run along the north-east side of Conner Road. Conner Road is a local street that serves commercial and industrial land uses on the south-east end of the project. The roadway serves residential properties and Conner High School towards the northwest end of the project. The CVG Trail has much community support including a group known as the Friends of CVG Trail. This trail is a network of multi-use paths that will form a loop around the CVG airport. 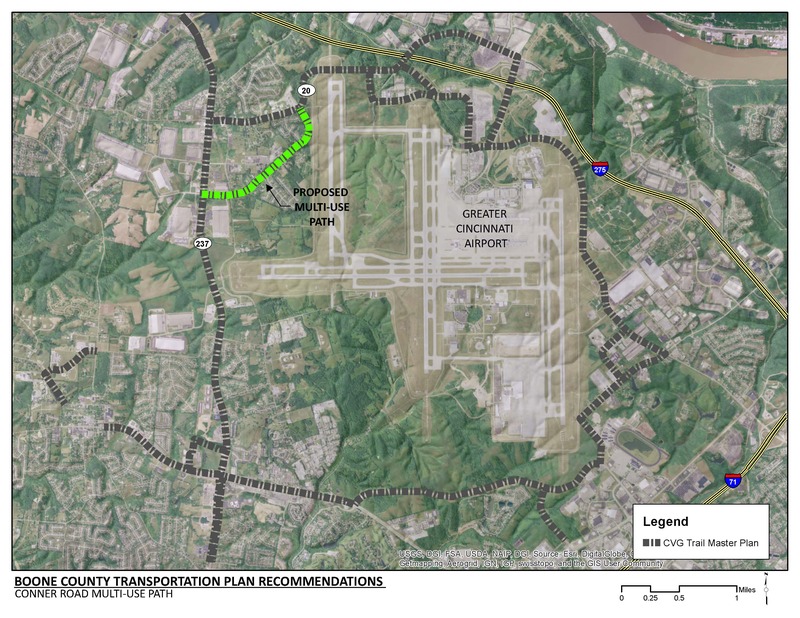 This multi-use path would contribute to the CVG Loop Trail network. There is an existing portion of sidewalk, approximately 1,000 feet in length, along the northeast side of Conner Road. There is an existing sidewalk along the southern portion of Wright Boulevard. A multi-use path is proposed as part of an active project along KY 237.